The most common reason for a noisy water heater is sediment collecting in the bottom of the heater. The noise is caused when the hot water bubbles up through the sediment in the bottom of the tank. When this occurs, it causes a popping sound. There are two ways to prevent sediment buildup in the first place. Flush your water heater out periodically. To flush the sediment out of the tank, empty it, open the cold water intake and fill the water tank halfway while allowing the stream of the water to rinse the sediment from inside the tank. Empty the water through the drain valve and repeat the process until you do not see any signs of sediment left in the tank. Install a water softener in your home. The water softener will eliminate the sediment that builds up in your tank. If left unchecked, the sediment buildup can lead to bigger problems in the future. The most serious problem that can occur is the bottom of the tank can rust out and begin leaking, which is often indicated by a rumbling sound. Once it begins to leak, replacing the water heater is the only option left. Shut off the water supply to the water heater, also shut off the electrical power, if you have an electric water heater, or the gas supply if you have a gas water heater. Drain the water out of the water heater tank by opening the valve at the bottom of the tank near the floor. It may be helpful to attach a garden hose to the drain valve and run it to a nearby drain to avoid a big mess. 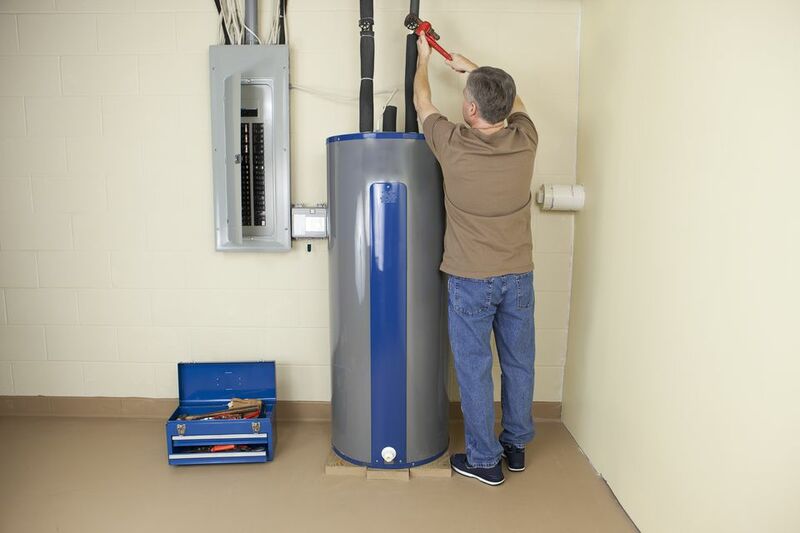 Once the tank is empty, you can disconnect the gas line, flue pipe and water lines for a gas water heater, or the power wires and water lines for an electric water heater. When the old tank is out of the way, clean up the area to make it ready for the new water heater, then you can set the new unit in place. Begin reconnecting the water lines, the gas or electric supply and the flue pipe for the gas water heater. Make certain in the case of a gas water heater that you check your gas line joints with soap bubbles for gas leaks. If the relief valve is fully closed, you may hear a sizzling sound associated with this issue. Fluctuations in water pressure can cause a ticking noise. You may also hear a ticking noise that is attributed to loose pipe straps that hold the hot water lines coming out of the water heater. You can stop the noise by putting plastic spacers between the pipes, and the straps. A sizzling sound can indicate water is leaking from the tank, and onto the hot burner assembly. In addition, a hammering or knocking noise often indicates the water flow is being stopped suddenly. Most plumbing systems have built-in measures to control this situation, such as some type of air cushion device in the plumbing lines. However, water pressure from the street may fluctuate, and the air cushions may become waterlogged, resulting in the hammering noise. This is not caused by the water heater, but it can cause some serious damage to the unit. One way to stop this noise is to drain your entire plumbing system by turning off the water supply to the house and then opening up all of the faucets to allow the air cushions to fill back up. After a short time, you can turn the water supply back on and close all of the faucets.